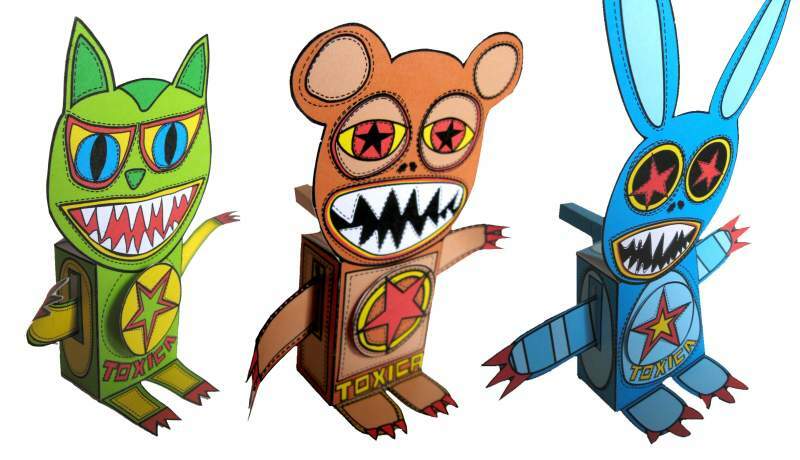 These cantankerous automata critters were created by Juan Diego Sanin. Turn the cranks on their backs and their arms wave and the stars on their chests rotate. From left to right we have Gato Satanico (Satanic Cat), Oso Maloso (Bad Bear), and Conejo Malgenio (Cranky Rabbit). Templates for the automata may be downloaded here. Here's some nice stone textured papercraft dice by artist William McAusland. If the templates for these dice are printed one per page, the dice come out rather large, so I printed out four templates per page instead. Doing so resulted in the finished dice being a more usable size. 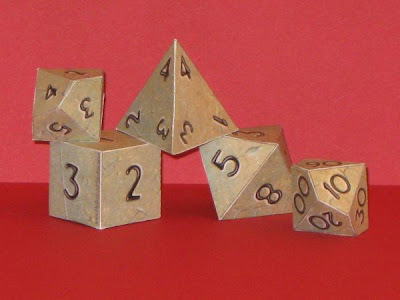 Six different dice are available, four of which are pictured: d4, d6, d8, and a pair of d10 dice that are equivalent to a d100. Not pictured are the d12 and d20 dice. Templates may be downloaded here. The Reborn! anime series follows the trials of an Italian mafia family by the name "Vongola". In the show, Tsuna, the last male heir of the Vongola family, is trained by an infant assassin so he may one day take his place as the boss of the family. 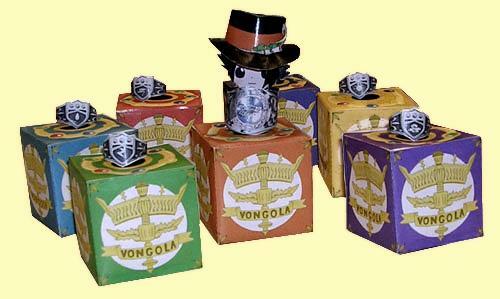 The mafia assassins in the show make use of "box weapons" that may only be activated by using a corresponding ring. These papercraft versions of the weapons are the work of deviantART member "Desubunny". The box weapon templates may be found here, while the ring templates are available here. 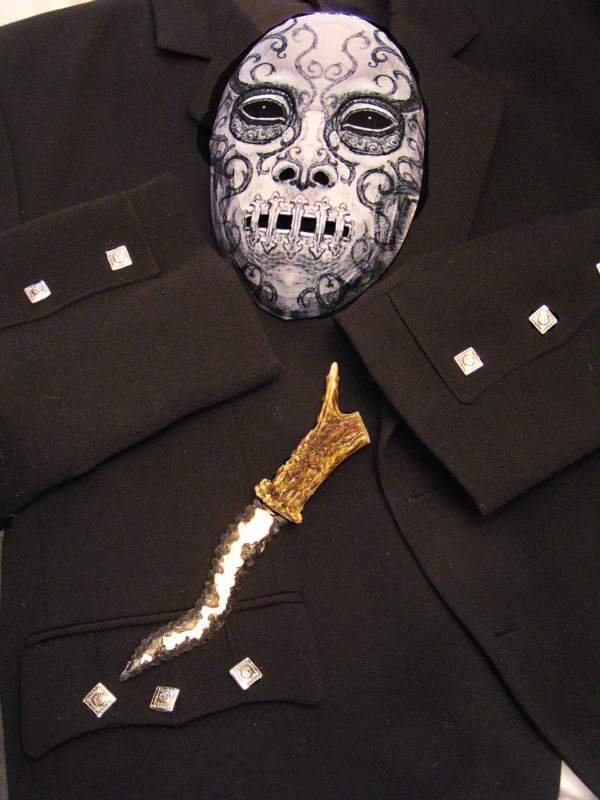 Gregory Belland sent me this excellent build photo of my Death Eater Mask #1 papercraft. Greg told me he built the mask for a friend then took this photograph which he entitled Death Eater Prepares. Seeing this photo makes me want to do some more Death Eater masks. ;) Nice work Greg! Mmm, strawberries... 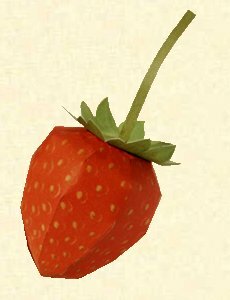 This realistic looking papercraft strawberry was created by the folks at the Fragarixie pixie blog. Fragarixie is the home of a online comic about a family of tiny pixies who live in the forest and grow strawberries. The template for the strawberry was offered as a free download in the early days of the blog. As the story goes, Pixie Grandpa found the strawberry template among the ancient Fragarixie scrolls. Click on the picture here to build one of your own. While I was digging around James Bowen's site for the previous post I came across this papercraft from the Halo series of video games. It is a M12 Light Reconnaissance Vehicle, more commonly known as a "Warthog". 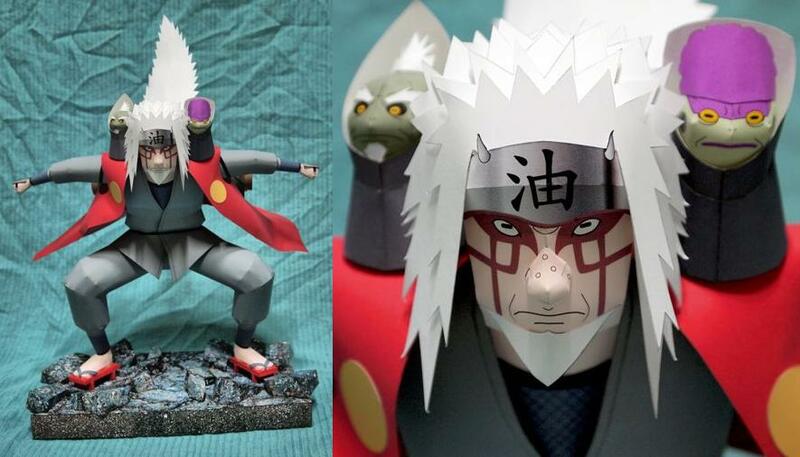 Pretty neat, eh? 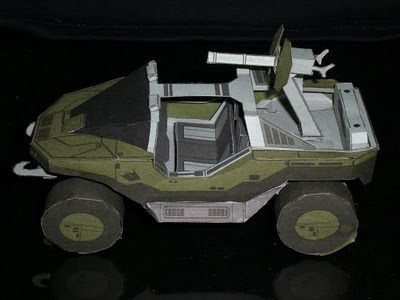 This is the first Warthog paper model I have seen and with a template at only 2 pages and 30 parts, it should not be that difficult to build. The template is located here. 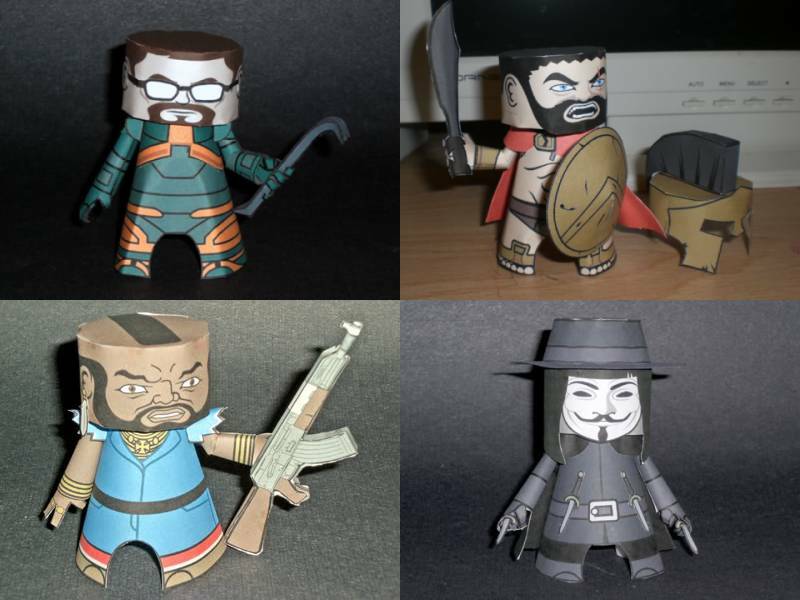 James Bowen, the creator of Ham Headz paper toys, is probably best known for his superhero paper toys, but over time he has added characters from outside the world of comic books. Pictured above are some of my favorites. Starting in the upper left and going clockwise are Gordon Freeman from the Half-Life series of video games, King Leonidas from the movie 300, V from the movie V for Vendetta, and B. A. Baracus (played by Mr. T) from the A Team television show. You gotta love the mini 3D weapons Bowen gives his toys. Templates are available here. 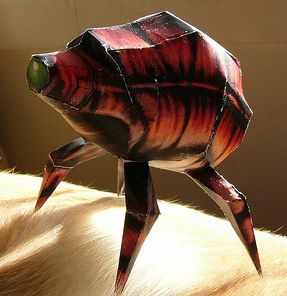 This papercraft snark from the Half-Life 1 video game was released in 2006, so newer papercrafters may not have seen it before. In the game, snarks are explosive living creatures that may be used as grenade-like weapons. 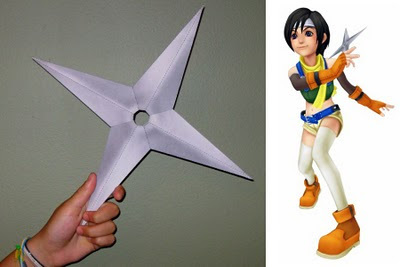 This papercraft is the creation of Bhautik Joshi and may be downloaded here. You will also find a mini Half-Life crowbar paper model and some Quake papercraft at Joshi's site. One of the readers of my blog who goes by the name "b0bman" has designed his first paper toy. He asked me if I would post his design. Always happy to help a new papercraft artist get started, I said "yes". B0bman calls his paper toy "Minion". I presume this somewhat sinister looking minion has a master somewhere even more sinister than himself. 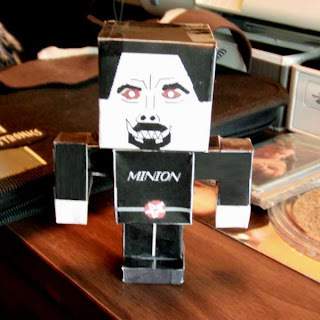 ;) A PDF template of Minion may be downloaded here. 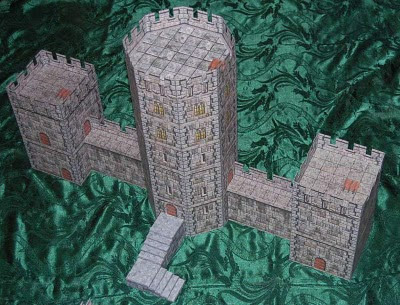 This castle is a fan modification of a 3D papercraft creation by Fat Dragon Games, a company that produces finely detailed paper buildings and props for miniature games such as Heroclix. The castle is built from modular papercraft units that are stacked on top of each other. The octagonal tower parts come in a free multi-layered, customizable PDF file. 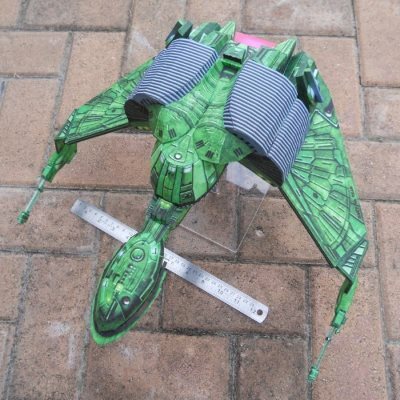 The remaining rectangular parts of the castle are available for purchase from Fat Dragon. To download the octagonal tower PDF go here and click on the link labeled "Afet's Tower". 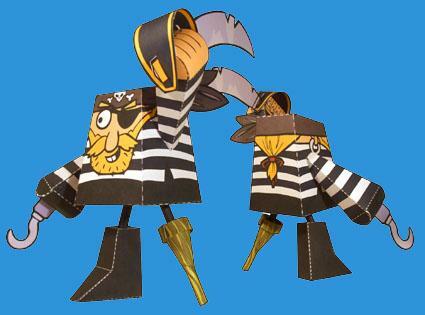 The full name of this pirate paper toy is "Pesky Pete Pascoe the Pirate of Penzance". Pete is the work of UK illustrator Trystan Mitchell. I really like Trystan's clean "cartoony" style. This paper toy is not quite all paper as the legs are made out of pencils or wood dowels, but an inventive papercrafter should have no problem rigging up small tubes of paper that will work just as well. The two page template for the pesky pirate is located here. I don't usually post projects from the "crafty" branch of the papercraft family tree, but I thought these little gems were worthy of attention. 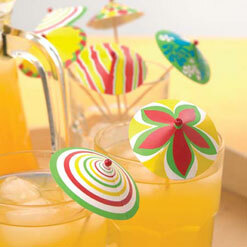 Nothing says "festive" like a umbrella in your drink, especially when you are at a summertime party. These do-it-yourself papercraft drink umbrellas come in six different patterns all contained in a single printable PDF file available for download here. In addition to the paper shades, all that is required is wood skewers and some plastic beads for the top. "Mad Mike" at the Smart Forum, an online forum for German owners of Smart Cars, has created a Smart Car papercraft based on digital photographs of his very own car. 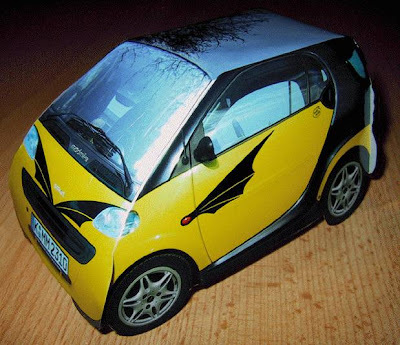 Mike's car has been customized with what he calls "dragon tattoos". I am still curious how he was able to photograph the reflective roof of the car without himself showing up in the reflection. The .GIF template for the car may be downloaded here.